The Revised Standard Version of the Bible is acclaimed by many as the clearest, most accurate and most beautiful modern translation of the Bible. This new large print version, in a deluxe bonded leather edition, with many other special features, makes this popular yet beautiful Bible translation more accessible and appealing to a wider reading audience. Among those features are the lovely gift box it comes in. The RSV Catholic Edition remains the translation used in official Church documents and served as the basis for the scriptural text used in the Catechism of the Catholic Church. 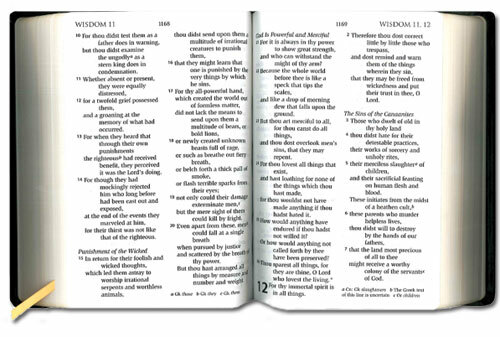 Sample image of the Bible, click on the image to see the large view.